This house is an architectural gem – it’s old and has a breathtaking historic stone exterior. However, the kitchen was dated with 1980’s finishes, not living up to the glory of the rest of the house. The layout wasn’t functional, was cramped and felt akin to a complicated fun house filled with mirrors. The new design enhanced the windows, added light and pure simplicity to the space. We kept it clean and symmetrical with quiet colors. Through optimal cabinet space planning and opening up a doorway, a path to the family room was created, connecting both spaces. 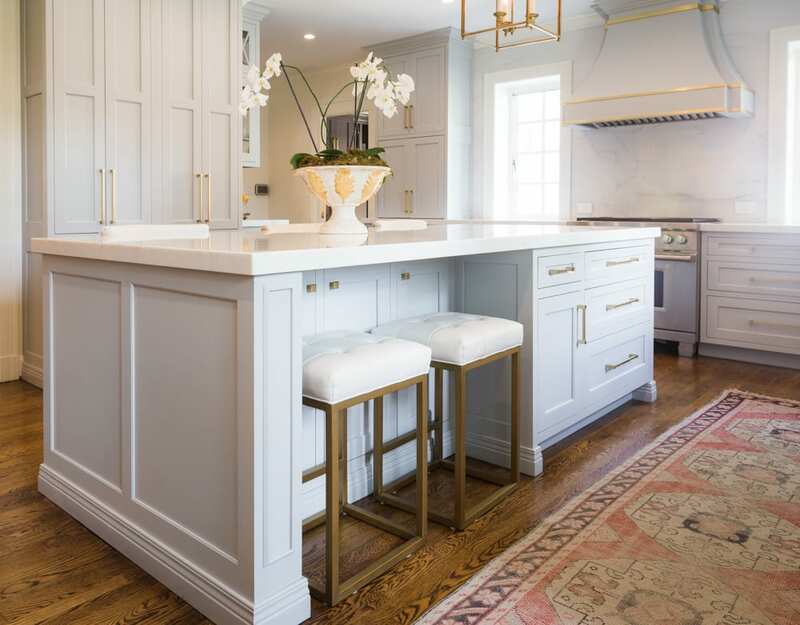 The homeowner wanted a symmetrical, long, classic island with seating on both sides. We executed this wish by tucking two extra stools under the island on the sink side. The bar is the focal point of the kitchen with a breathtaking arched valance and antique mirrors over the sink. The dramatic color resides in the gold and brassy tones alongside the subtle grays and whites. The homeowner’s antique rugs were the perfectly pink toned accent, giving the space an added touch of age, charm and color. Wondering what it looked like before, view the surprising before pictures for this beautiful kitchen renovation. This project was a loving collaboration between craftsman, designers, architects and a passionate homeowner with fantastic taste!